Note: The content published here is just a summarized version of complete study available on Github repo page. This project is about an Android application which allows users to explore various Urdu Fonts, eventually helping them in choosing the right one. 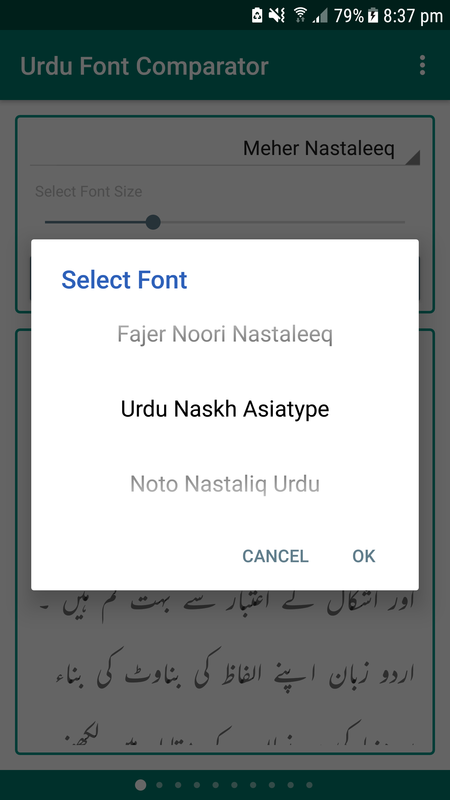 This project is additionally intended to make users appreciate why Nasta’liq script should be a natural choice for Urdu content on mobile devices. I have already written about How I ended up working on this project as a blog post. More importantly, see and appreciate why Nasta’liq script is better than Naskh and should be a natural choice for Urdu content on mobile devices. Application (at point of writing) includes 9 Fonts in total containing 6 from Nasta’liq, 2 from Naskh and 1 from Riqa script. You can download the Android application from [Google Play] (https://play.google.com/store/apps/details?id=com.androidistan.urdufontcomparator) and I have also made my project code available as open-source on Github. I have spent a considerable amount of time and effort to research on this subject and shared all gathered information along with my analysis on Github repo page. Urdu is my mother tongue, lingua franca as well as the national language of Pakistan and widely spoken in 6 countries by 60+ million people but still Urdu as a language has not been successfully integrated with what we know as “Digital Age”. I wanted to play with Urdu fonts for a while but was still not getting a starting point or a solid motivation to do it. 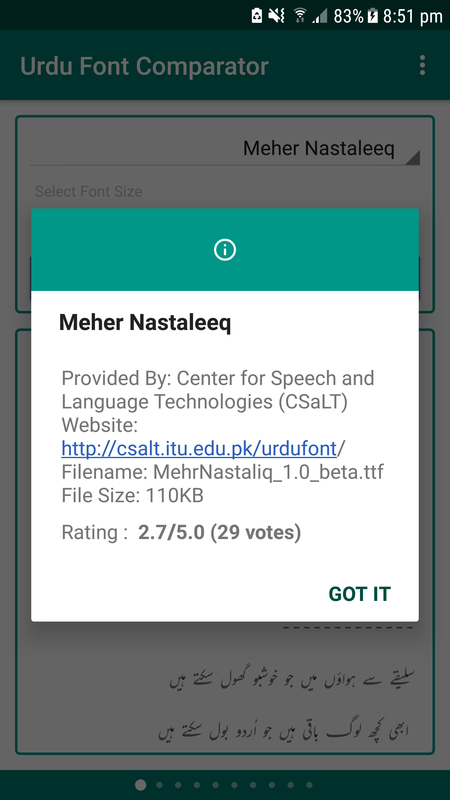 This idea originated when I read the news about a new and much improved font, Meher Nasta’liq launched by Center for Speech and Language Technologies (CSaLT) lab at International Technical University (ITU), Lahore (Pakistan). The website claims it to be a step towards advanced Urdu Typography and a font which serves the need of modern mobile applications. Even Dawn covered a story about it being a Calligraphy-based Urdu font for the Internet. It was enough to catch my attention and I wanted to try it out and see how it is different from other fonts, especially Jameel Noori Nastaleeq Font, which is considered to be the best so far. Then once I started thinking about it, I realized that there is no app or resource where I can see how Urdu text looks like rendered in different fonts (there are a lot actually!). As mentioned, I started this project to address a problem I was facing but in a broader picture, I am quite hopeful that it will encourage developers to create apps with Urdu content. Additionally, I didn’t find any resource which addresses questions like why Urdu has a limited reach when it comes to Internet or Mobile devices and technical comparison of Naskh and Nasta’liq scripts. My goal is also to convert this research into an information source which provides answers for those who are equally concerned and interested to dig deeper in this area. Long story short, it can assist you in making a better decision on choosing the right Urdu font for your Android app or mobile app in general. The font is always a key element of the UI which impacts user’s first impression of the app. It is believed that choice and attractiveness of the font makes the application visually appealing. The beauty, aesthetics and size of a font are one of the key factors. The choice of font matters a lot because it makes the text more natural to read and fairly easy to understand. Urdu as a language has an Indo-Aryan base and is written from right to left like Arabic or Farsi. According to linguist-historians, it started evolving from Farsi and Arabic contacts during the invasions of the Indian subcontinent by Persian and Turkic forces from the 11th century onward. By and large, Arabic today is written in Naskh and subsequently the Urdu text you see on Web is also predominantly in Naskh script. Urdu is not a child of Arabic but somehow Naskh was accepted as de facto style for Urdu on Internet. Urdu is typically written in a Nasta’liq style i.e. the connected letters in a word tend to follow a sloping baseline. The difference between Nasta’liq and Naskh is much more than just a different style and Nasta’liq is deeply connected to feelings of origin and pride of Urdu speakers (at least for those who care). Nasta’liq, based on a century-old calligraphic tradition, is considered one of the most beautiful scripts on the planet and also known as “the bride of calligraphy”. I believe limited use of proper font for Urdu language has over the years led many people to lose interest in reading Urdu on Internet. I personally believe in order to make Google and other big players genuinely interested in doing their part, we first have to make them believe that Urdu as a language can no longer be ignored due to it’s use and reach. The more we start using and publishing mobile apps with Urdu content, the more it will get the deserving attention. Local IT industry and governing bodies can then push through various channels with more confidence and substance. Continue reading on Github repo page.